Your business happens out here. You need an advanced crash protocol with rapid response technology. It’s important for drivers to have the right training, tools, and level of accident preparedness. With the AccidentPlan mobile app, you and your business are road ready. Uncontrolled claims lead to increased premiums. You can still be sued, even when you are not at fault. You face your greatest exposure at the moment of least control. 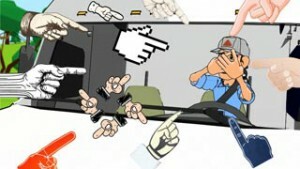 Public Perception is slanted against the motor carrier. Professional drivers are rarely responsible for crashes, but regularly receive the blame. Poorly planned protocol can lead to driver thought-paralysis in a crisis situation. Current practices are cumbersome, outdated and poorly organized. You must protect your business! If you control the narrative, you control the claim. Rapid response leads to rapid resolution – a faster close – and a less expensive claim.